Record Description Found on private land at Barf End, Gunnerside by Pete Roe. It is currently on loan to the Countryside Museum at Hawes. The description below is by Richard Watts and the drawing by Peter Reynolds, Yorkshire Dales National Park Authority. 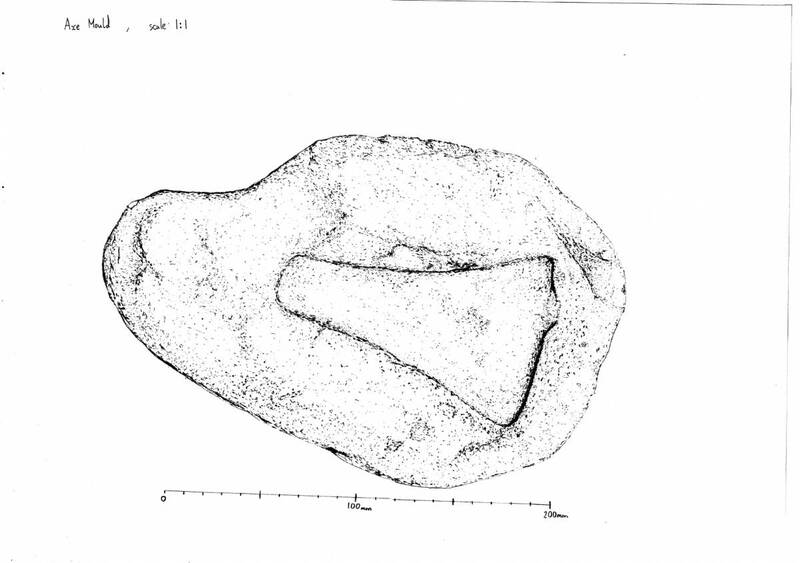 This is a probable flat-axe mould, most likely dating to the early/mid Bronze Age (based on typological similarities). It is composed of a single piece of sandstone, measuring c. 27cm x 19cm x 7cm. The stone is fairly smoothly rounded, suggesting it has spent some considerable time in a stream or running water, prior to being carved. The mould carving measures 14cm long, and is approximately 0.75cm deep, though it is less deep at the blade end â€“ this is most likely intentional, and would help to produce the cutting edge. It measures 9cm wide at the blade end, which narrows to 3cm wide at the haft end. 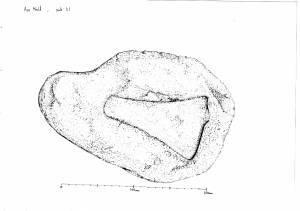 It would have produced flat axes of a very simple design, without a hafting socket, strengthening ridges or flanges. The carving remains remarkably sharp, though has suffered some slight damage, most likely incurred as the artefact was used for walling stone. The base of the mould is not entirely smooth, and would result in the derived axes needing some polishing and finishing before they could be used. The artefact was found at an isolated farmhouse, near Gunnerside, known as Barf End (SD959986). The mould weighs approximately 4.25kg, and would therefore have been reasonably portable, though given the isolated nature of its provenance, it may not have travelled very far.